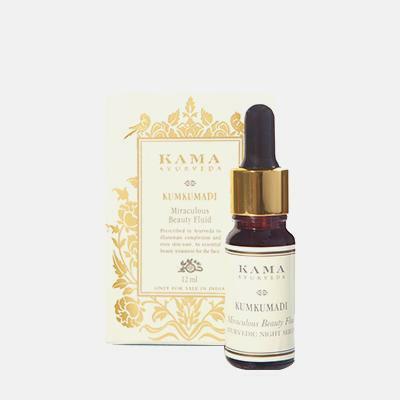 Kama Ayurveda is the perfect organic and wellness brand to go for this winter skin care regime. 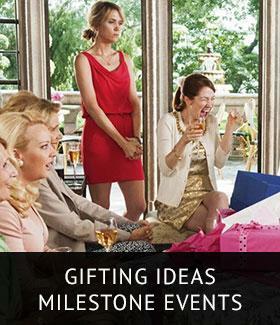 Keep reading to know more! 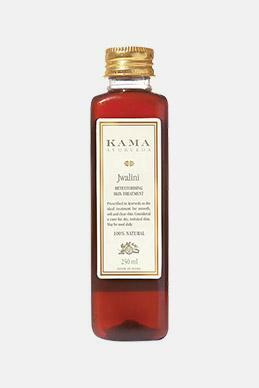 Kama Ayurveda a leading Beauty & Wellness brand provides pure, Natural & Organic Products. The brand provides a wide range of traditional Ayurvedic treatment product for hair, skin regime, and body for both men and women. The traditional Ayurvedic products are natural, 100% tested with no artificial colours, fragrances, animal ingredients and petrochemicals. 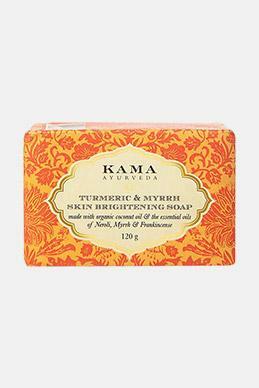 Kama Ayurveda products are the perfect brand pick for winter skincare regime to repair and moisturize skin. 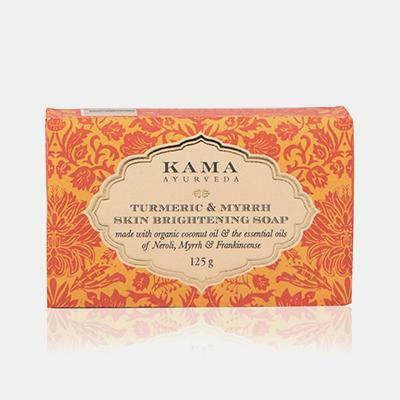 Turmeric & Myrrh Skin Brightening soap has ayurvedic cleansing treatment for dull, damaged and hyper-pigmented skin type. Turmeric is a powerful antioxidant, antibacterial and anti-inflammatory agents that lightens the skin tone and also helps in reducing pigmentations and blemishes, which enhances the product. The extra virgin coconut oil and beeswax nourishes the skin, keeps it soft, hydrated and protected. Usage: Wet skin with lukewarm water, and gently apply the soap creating lather. Rinse it clean. Anti Acne Cleansing Foam is a great pick for acne prone skin type. It is a mild cleanser and an acne-clearing cleanse that helps in reducing breakouts and blemishes. 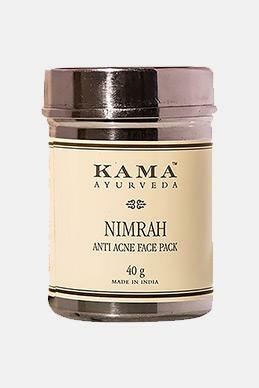 Neem oil reduces pimples and lessens the post-acne scars. The tulsi detoxifies, clears blocked pores and protects it from further inflammation without making your skin dry and flaky. The tea tree extract combined with salicylic acid helps to reduce breakouts and boost skin renewal. Usage: Take the required amount on your palm. Apply it on damp skin. Gently massage it in circular motions. Rinse and pat dry. 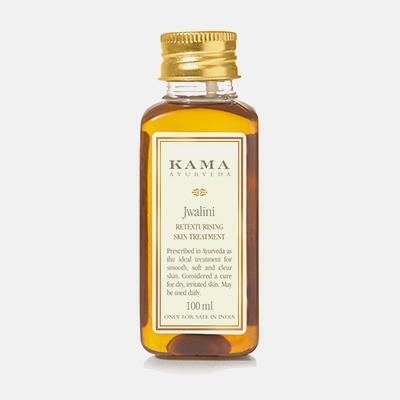 Jwalini Retexturising Treatment Oil is the ideal choice for sun-damaged and sensitive skin and also for hyper-pigmented skin type. 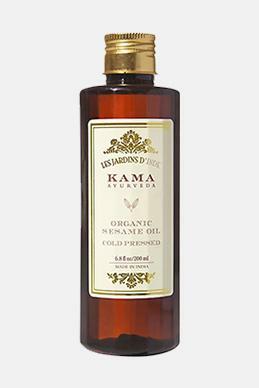 The oil is formulated and processed with pure Coconut oil and Sesame oil. The ‘Varneekarana’ qualities include Costus and Cardamom which improves the texture and skin quality and lead to a healthier, supple and glowing skin. Can also be used if you are experiencing itching, rashes and sunburns on skin or body. Usage: Take a small quanity on your palms and gently massage it on your skin. Leave it on for 30 minutes. Cleanse post-treatment with a mild cleanser and lukewarm water. 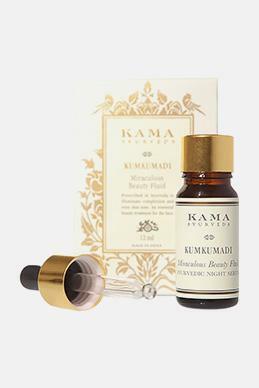 Kumkumadi Miraculous Beauty Fluid Ayurvedic Night Serum goes well for a dry skin type. It has the unique blends of oils and herbs for better moisturising and hydration. 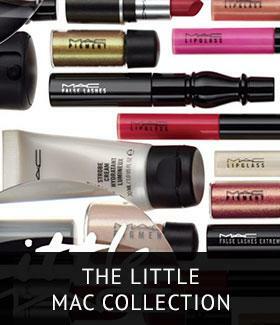 Also, it includes pure saffron that helps in illuminating the complexion of the skin. The extracts of Indian madder, banyan tree helps in smoothing fine lines and repair early signs of ageing, the cooling and cleaning agents do wonder. 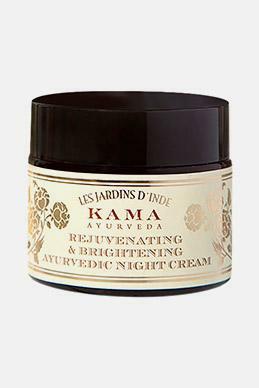 The perfect product to include in your night time regime. Usage: After cleansing, dampen your skin with water. Take a few drops of the night serum on your palm and apply it all over your face with the help fingertips. Gently massage it onto your skin until it is fully absorbed. Keep it overnight. 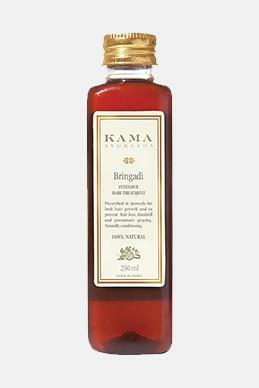 Rejuvenating & Brightening Ayurvedic Night Cream has a powerful Ayurveda formula that is created from the finest saffron from Kashmir. The rich saffron lightens uneven skin tone, also reducing dark circles and pigmentations. It also repairs signs of ageing, giving a nice bright glow. It also has the combination of Indian madder and aloe vera that keeps the skin protected. Usage: Apply the cream on face and neck at night, after cleansing. Massage all over with upper strokes until it is absorbed. A thick and intense blend of cold pressed Coconut oils and Jojoba oils just make it the ideal pick for the dry skin type category in winters. The blend of Natural butter like Kokum, Mango, Shea helps the skin to replenish acts as an anti-ageing agent whilst lighten stretch marks. 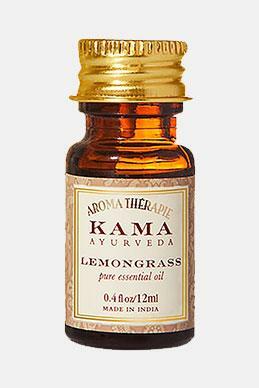 The cooling extract of essential oils of Lotus soothes and help the kin to relax and restoration. Shea Lotus Body Butter nourishes moisturises and replenishes the skin collagen levels. Usage: Apply a generous amount of body butter after a bath and massage in upward strokes. Reapply to areas which feel rough and dry. Bringadi Intensive Hair Treatment is the perfect hair oil treatment for hair loss, dandruff issues, premature greying and gaining the shine back. 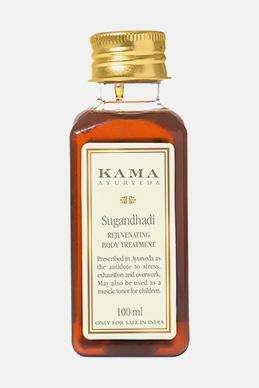 The Ayurveda aspects like specific herbs blended into Sesame oil and Milk. Indigo, Eclipta Alba and Gooseberry ingredients in the product act as a cooling agent. To prevent scalp infections and itching Antifungal Licorice and antibacterial Balloon Vine are the ingredients included in the product. Usage: Take enough amount of oil and gently massage the scalp. 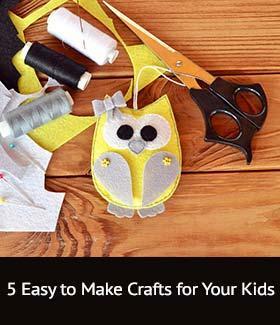 You can also keep it overnight. It also acts as a conditioner if left on for at least 20 minutes. 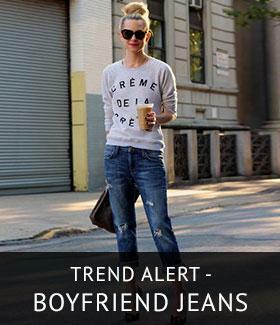 Wash it off with lukewarm water and a mild shampoo. 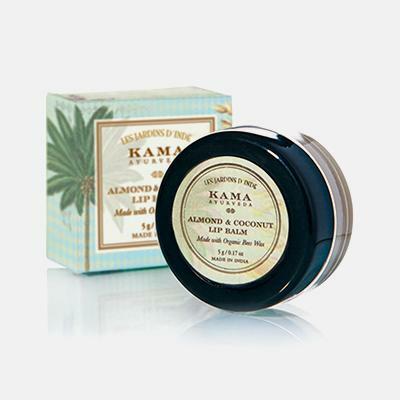 Rich and creamy texture Almond and Coconut Lip Balm is a treat to your lips. The nutty lip balm moisturizes the lip keeping it drying and also preventing it from getting tanned. 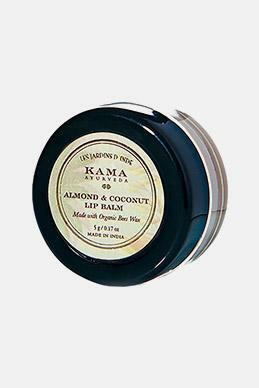 This creamily textured lip balm is a blend of Coconut oil, Castor oil and organic Almonds which keeps the lip moisturized and supple during the winter. Usage: Take a small amount of lip balm on the fingers and apply it on your lips. Apply it whenever lips feel dry. Winter skincare regime is the most important to keep your skin hydrated and moisturized. 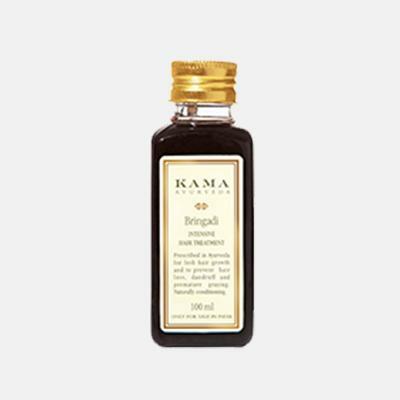 These Kama Ayurveda products are the best natural and most effective brand to include in your winter regime.